XSLT is also an XML, which makes it consumable by another XSLT, i.e. XSLT is analyzing XSLT. The big difference is that XSLT Lint is also fixing problematic code. Notice line break between attr1 and attr2 is not lost: if XSLT lint would work by serializing XSLT as XML, line break would be lost so line diff would become distorted. The result of these efforts is a GUI program that let user select folder w/ source XSLT, select refactorings to apply and view resulting line diff. This refactoring merges consecutive opening and closing tags. This refactoring merges non-consecutive opening and closing tags, ignoring whitespace but not comments. This refactoring changes excessively verbose xsl:element to directly coded XML. This refactoring changes excessively verbose xsl:attribute to directly coded XML. This refactoring changes xsl:variable w/ single xsl:value-of to shorter form. This refactoring changes xsl:param w/ single xsl:value-of to shorter form. This refactoring changes xsl:with-param w/ single xsl:value-of to shorter form. This refactoring changes xsl:attribute w/ single xsl:value-of to shorter form. 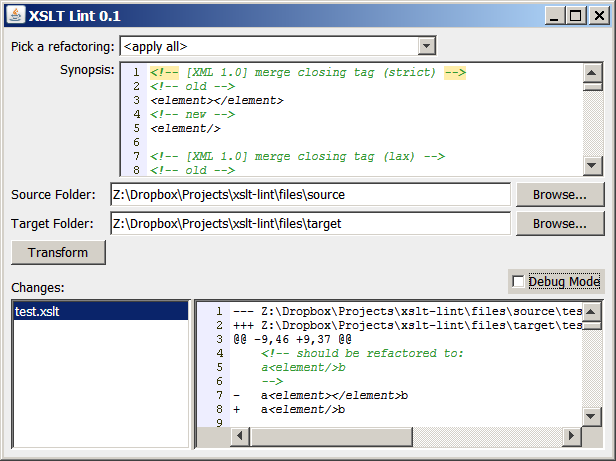 This refactoring changes xsl:message w/ single xsl:value-of to shorter form. This refactoring changes xsl:for-each w/ single xsl:apply-templates to single xsl:apply-templates. This refactoring merges consecutive xsl:apply-templates to single xsl:apply-templates. Synopsis — displays an example of how code will look "before" and "after"
XSLT Lint can be launched online: http://www.gerixsoft.com/sites/gerixsoft.com/files/xslt-lint/xslt-lint.jnlp. Note: This is Java webstart application, you must have Java installed on your computer to run XSLT Lint. The message (NOT VERIFIED) Andriy Gerasika that you will see is OK, since I was using self-signed certificate. refactorings already implemented -- are they correct? it's not nice to be obliged to run a self-signed application. And , yes , it's a nice tool, although it would be nice to separate the safe rules and the others.